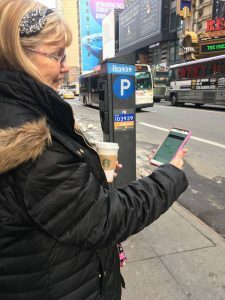 Dodie, a 65-year-old with Multiple sclerosis (MS), used mobile technology to assist her recently while traveling to NYC to celebrate her granddaughter’s 16th birthday. Her limited mobility often poses challenges when traveling. Dodie used TripAdvisor in the months prior to traveling to research accessibility friendly hotels and tours. She used Google Maps and Uber apps to help her get around the city. And, while in NYC, Dodie enjoyed using the camera on her device to document the sweet memories that she shared on Facebook and Instagram. Yes, grandma uses social media! She says it is a fun way to stay up to date on what her 9 busy grandchildren are doing. 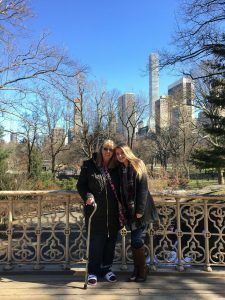 And, using apps on her mobile device made the trip to NYC less stressful and a super fun travel experience with her granddaughter. If you or someone you know with accessibility needs will be traveling soon, have them check out our travel friendly accessibility apps below and visit our App Search Tool for a list of Apps for Travel. TripAdvisor has a forum called Traveling with Disabilities that is an excellent resource for anyone traveling. To find wheelchair accessible subway stations, restaurants, and activities, Google Maps offers a new wheelchair accessible feature. Using the feature is fairly simple. To access the wheelchair accessible routes, type your desired destination into Google Maps. Tap “Directions” then select the public transportation icon. Then tap “Options” and under the Routes section, you will find “wheelchair accessible” as a new route type. When you select this option, Google Maps will show you a list of possible routes that takes mobility needs into consideration. This feature is rolling out in major metropolitan transit centers around the world, starting with London, New York, Tokyo, Mexico City, Boston, and Sydney. Google is working with additional transit agencies to bring more wheelchair accessible routes to Google Maps. Uber XL can be exceptionally handy when traveling by vehicle. The larger vehicles provide more spacious cargo areas for walkers. And a new feature of the Uber app is uberWAV. Riders who use motorized wheelchairs or scooters can in certain cities request a ride in a wheelchair-accessible vehicle (WAV). uberWAV driver-partners are certified by a third party in safely driving and assisting people with disabilities. Access Earth is another new app that allows people with mobility disabilities to rate restaurants, hotels and tourist attractions around the world based on how accessible they are. The app is a community of people working to make travel easy and equal. Members give each other the specific information they need to try new restaurants, hotels and tourist attractions without worrying about accessibility.